Discover the natural beauty and extraordinary wildlife of Falmouth Bay, The Helford River Frenchmans Creek and The River Fal & Creeks, on one of our idyllic cruises or dance the night away at a party celebration with a difference. We are a proud Falmouth family with many years of experience navigating the local waters so join us on board the MV Princessa for a voyage to remember. Let us guide you through the beautifully rugged Cornish landscape including some of the county′s most fascinating historical and geological sights. All Aboard The MV Princessa! 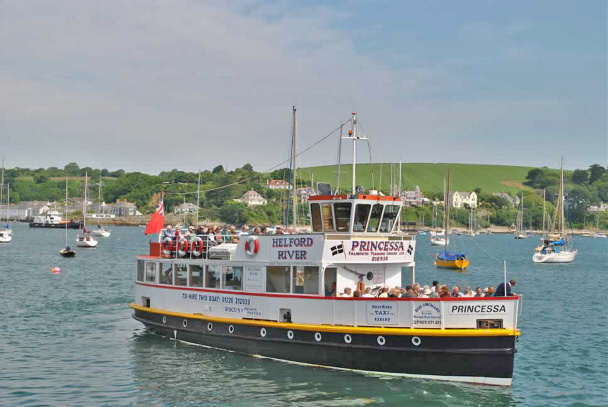 All our cruises onboard the MV Princessa, operate daily from the Prince of Wales Pier, Falmouth. We offer all the amenities you′d expect of a modern boat including a fully licensed bar, flushing toilets and a spacious lounge area. We cater for coach and group parties, the Princessa is also available for Private charter 2, 3 or 4 hour excursions so whether you’re looking for a sunset cruise or a unique party experience, a floating celebration with a difference, contact us and we’ll make your special occasion unforgettable.